Burj Dubai developer Emaar has confirmed the Burj Dubai will open on the UAE National Day. The Burj Dubai is scheduled for opening on December 2. Emaar chairman Mohammed Alabbar said 12,000 staff were working to complete the remaining works on the world’s tallest building. Cladding work on the shiny silver-colored tower’s outside is complete. Completion of the aluminum and glass facade marks a key milestone for Emaar Properties, which is racing to meet a self-imposed deadline to have the Burj Dubai complete by the end of the year. By way of comparison, the builder says the amount of aluminum used on the building’s face weighs as much as five double-decker Airbus A380 jetliners, while the more than 1 million square feet (103,000 square meters) of glass panels could cover 14 soccer fields. The Burj Dubai, Arabic for “Dubai Tower,” stands more than 2,600 feet (800 meters) tall, though Emaar has yet to confirm is final height. 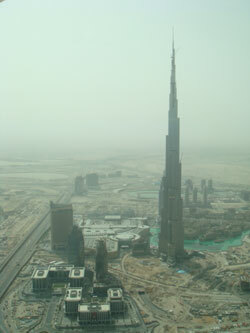 The final cladding on the Burj Dubai was installed at the start of October, 18 months after the project began. In total, there are 24,348 cladding panels covering a total curtain wall area of 132,190 square metres and using 103,000 square metres of glass – enough to cover 14 football pitches. The 15,500 square metres of embossed stainless steel is the equivalent of 34 basketball courts, while the total length of gaskets – 2,050,000 linear metres – would reach from Dubai to Damascus if laid end-to-end. The total weight of aluminium used on the Burj Dubai is approximately the same as five A380 aircrafts and the total length of stainless steel bull nose fins is 293 times the height of the Eiffel Tower.